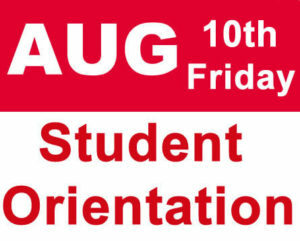 Student Orientation will be held on Friday, August 10th at HS Advancement. It is highly recommended that ALL students/parents/guardians attend this orientation. This is where you will be able to purchase uniforms, bus passes, student parking, School fees- ID, Register for the P.T.O, submit any missing documents, update personal information, complete medical records, and lunch forms as wells as receive information on school policies/procedures., etc. These items will NOT be done on the first day of school! Please make plans to attend with your student(s). The grade levels are asked to come at specified times as to reduce the wait times in line. Please adhere to the above schedule. If you have siblings that attend HSA you may come at the designated time of the OLDEST student. *Only checks, money orders or credit card payments will be accepted. *No one will be allowed in after 11:45 am & 2:45 pm so that we may wrap up at the appropriate time. Thank you and we look forward to seeing everyone on Friday, August 10!